Bukhara, Uzbekistan: a World Heritage Site and One of the Most Incredible Ancient Cities in the World. From Khiva, we took a midnight flight to Bukhara, where we checked in at the Komil Boutique Hotel. This privately-owned bed-and-breakfast, built over 100 years ago, is located in the heart of the Old City. The young proprietor had waited up for us, and he graciously led us to a unique, exquisite room decorated in traditional style. Each room in the hotel remains as it did in 19th century Bukhara and ours was no exception. As tired as we were, we marveled at the intricately carved and hand painted walls, wood trim, and shelving. The old house was originally owned by a Jewish merchant, one of the wealthiest men in Bukhara, and was purchased 50 years ago by Komil’s grandfather. We enjoyed a wonderful night’s sleep and wandered into the 19th century breakfast room refreshed and ready to walk around Old Town. Because we were staying in the Jewish quarter, we explored that nearby area first. We visited the Bukhara Jewish Synagogue, and after that, the shop of a puppet maker. Amazingly, there have been Jews in Bukhara since the 12th or 13th century. They developed their own unique culture with its own language, Bukhori, which is related to Persian, but uses the Hebrew alphabet. Bukhara’s Jews still speak it, as do an estimated 10,000 Jews, most of whom now live in Israel. At the time of the Soviet Union’s collapse, Jews made up 7% of Bukhara’s population, but after they could exit, all but a few hundred left the country. Bukhara was founded over 2500 years ago, and I must say, this ancient city stole our hearts! It’s one thing to be old, quite another to be beautiful and old. 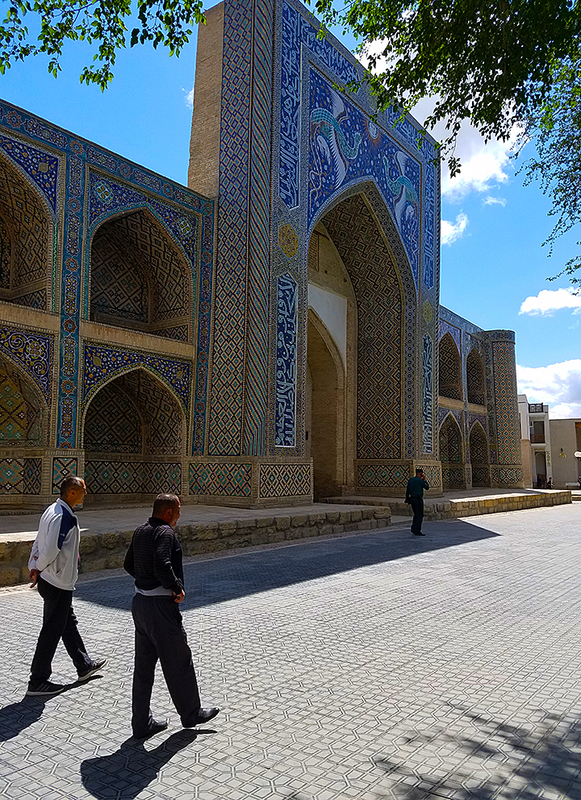 Bukhara blossomed as Central Asia’s religious and cultural heart as capital of the Samanid state in the 9th and 10th centuries and never looked back. In 1220 the city succumbed to the Genghis (Chingiss) Khan and in 1330, she became part of Timor’s Samarkand. Her second chance came in the 16th century when the Uzbek Shaybanids made it the capital of the Bukhara khanate. The city was turned into a vast marketplace with dozens of specialty bazaars and caravanserais, more than 100 madrassas housing over 10,000 students, and more than 300 mosques. From 1868 on, Bolsheviks took over and by 1914, the city was absorbed into the newly created Uzbek SSR. In the late afternoon, we wandered around the central park where we watched robed men levitating. We wondered how they did it while we browsed souvenir shops. Our guide had reserved a front-row table for us in an outdoor restaurant, where we dinned to a folklore performance and fashion show. It was a fitting end to a wonderful time in Bukhara. We looked forward to the next day’s adventures, when we would take a road trip to Aydarkul Lake, stopping at villages along the way, ending up at Yurt Camp.